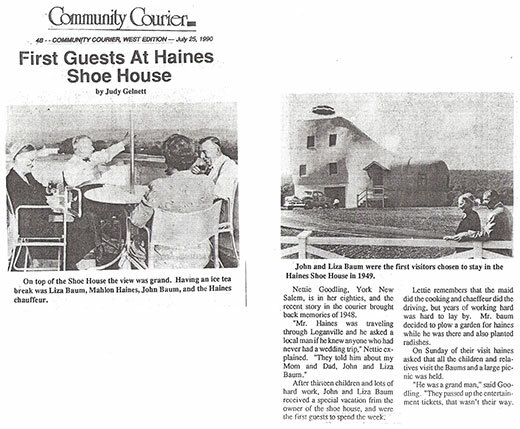 Sheila Myers shared this clipping of a 1990 article about her great-aunt and uncle, John and Liza Baum, who were the first couple gifted with a one-week stay at the Haines Shoe House back in 1948. Mahlon Haines went on to gift such stays regularly for milestone anniversaries and other occasions. I’m diving back into some older emails again this week and have a wide variety of topics on which to share questions, answers and memories – eight, about which I have short pieces of info to share that I hope and assume will lead to longer future columns. Some time ago, reader Sheila Myers wrote to me and shared a clipping from the Community Courier in 1990, describing the first couple gifted a one-week stay at the Shoe House by Mahlon Haines, the “Shoe Wizard,” in 1948. Haines began gifting couples such getaways for milestone wedding anniversaries and other occasions, and Sheila noted that her great-aunt and uncle, John and Liza Baum, were that first lucky couple. The story notes that the Baums were not given to relaxation, being used to hard work, so Mr. Baum plowed a garden while he was there! I’ve heard about those Shoe House vacations in the past, but did not have any information on that earliest couple before! I’d love to hear more about others who stayed there as a Mahlon Haines gift. Reader Bradley W. Buchar wrote to me about a year ago with some information tangential to a topic we talked about last week – York County’s musical groups. He said, “My father, ‘Lefty’ Buchar, was a guitar player and singer in Happy Johnny’s Gang.” He said the band was on WORK radio in the early 1940s, then on WBAL in Baltimore. “They were quite popular in York County and Baltimore, until the war came along,” he noted. “I have an album full of articles and signed pictures that my dad collected of the many performers he knew and played music with, such as Roy Rogers, Roy Acuff, Tex Ritter, etc., and the many places they played music,” Bradley wrote. Those places included Sunset Park, Brendel’s Manor Park, the Hippodrome in Baltimore and many more. I’m curious if it included Valley View Park, as I’m pretty sure I remember Happy Johnny’s Gang being among the groups I’ve heard performing there. Would love to hear more! Meanwhile, another reader, Cathy Staab, noted that she remembers the Peoples Drug in Queensgate was the first local store to be open on Sundays, and people picketed in protest. “My how things have changed!” Cathy wrote. David, I appreciate those memories. I wish that show was still around, because it sounds like it would be right up my daughter’s alley. She loves classic horror! Longtime reader Sarann C. Boring wrote to me with a few memories of the West York area to share. She mentioned that her cousin is Bob Rudisill, another longtime reader and commenter. Their great-grandfather, the two had both told me, lived on a farm in West York, moving there in the early 1880s, and the farmhouse is still standing next to the Reliance Fire Company going east. Moving away from the York area, some time ago, I shared several memories from the Hanover area that included Willow Beach Park, pool and skating rink. A reader named Mark Nusbaum was hoping to pin down this park’s exact location, and Mike Becker was able to provide that information. Mike noted Willow Beach “was located to the rear of the alley on the south side of the 800 block of York Street. It was entered through the alley beside 849/847(?) York Street,” he added. Mike, thank you for clearing that up! Last fall, reader Gina Hamme wanted to know if anyone remembered Chantiles Parking Lot, which was on the corner of Philadelphia and Beaver streets where the White Rose is now located. Longtime reader Bill Landes noted that his father’s cousin was married to George Chantiles who owned a haberdashery (hatmaker) at that site. “George later became a magistrate of some sort. He had brothers who were a dentist (Fred) and a policeman (Pete),” Bill wrote.